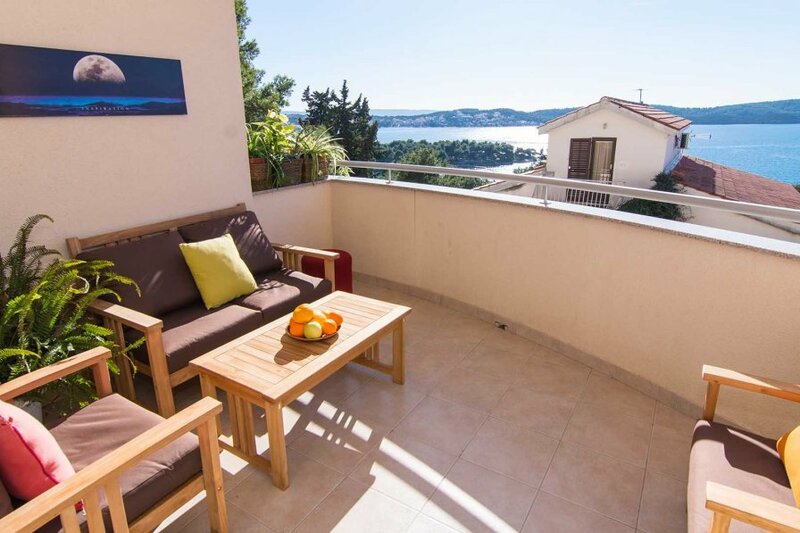 Apartment Olympus is a modernly furnished 4 star holiday apartment situated on island Čiovo, less than 2 km away from the historic UNESCO protected center of town Trogir and 7 km away from the Split airport. This stylish and spacious apartment is located just 200 m away from the sea and the nearest beach, with all amenities such as restaurants, grocery shops, marina, beach bars and water sport activities within walking distance. Apartment Olympus is located on the first floor and covers 80 m2. The apartment consists of 2 bedrooms with double beds, 1 bathroom with combined bathtub and shower, 1 half-bath, charmingly furnished and spacious living room with well equipped open concept kitchen and dining area. The living room has access to a balcony with a marvelous seaview, equpped with outdoor furniture and perfect for spending time with your loved ones during the summer evenings or having a first cup of coffee in the morning. Apartment Olympus is a suitable accommodation for up to 6 persons. Apartment Olympus is fully air conditioned and equipped with SAT-TV, wi-fi, iron and ironing board, baby cot, high chair, stove, oven, hood, refrigerator with freezer, dishwasher, microwave, electric kettle, washing machine and hair dryer. The property offers parking and transfer to and from the airport, free of charge. Pets are allowed, free of charge. Enjoy your stay in apartment Olympus and spend an unforgettable holiday on island Čiovo!